ID: Series of very small thin white connected rectangles that form a colony. Comments: This white bryozoan grows on kelp. I note kelp bryozoan most often in fall months when the broadleaf kelp is at its peak. ID: Thin, orange crust with small pores. 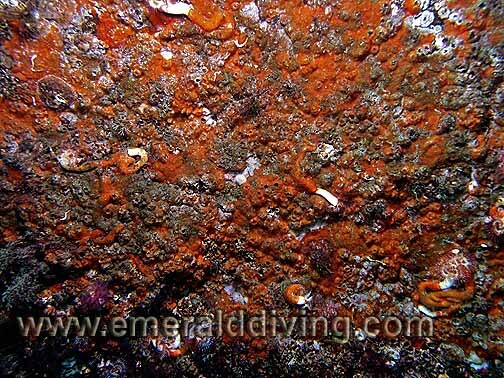 Comments: I typically note this rather unspectacular bryozoan on rocks at depths of les than 50 feet. ID: Series of intermingled ear-like folds. ID: Low growing, sprawling bryozoan. Uneven, rounded lobes yellow and brown in color. Comments: This bryozoan dominates many rocky areas in northern British Columbia and can give the rocky substrate a coral reef-like appearance. Photographed at Solander Island off Brook's Peninsula. ID: Hard texture. White and yellow branches that grow relatively flat. Comments: The first time I noted this bryozoan was in the San Juans Islands. With it's white color and flat pattern, I thought it was a dying staghorn bryozoan. Had coral bleaching reached the Northwest? 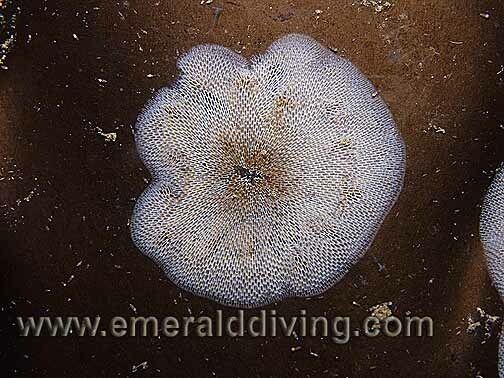 Not at all - it turns out the white branching bryozoan is fairly common throughout the San Juan Islands. ID: Cone-shaped appearance with circular rows of branches. Comments: I don't often note this small and bland colored bryozoan, most likely because it usually lives amongst dense invertebrate colonies which often dwarf it. I most often find small colonies of this bryozoan clinging to the underside of rocky current swept ledges in the San Juan Islands. ID: Tiny, low profile lichen-like encrusttion with fine lattice work. Irregular shapes. Comments: This is a very inconspicuous bryonzoan that you really have to look for as it is small and tends to blend in with its sourroundings. 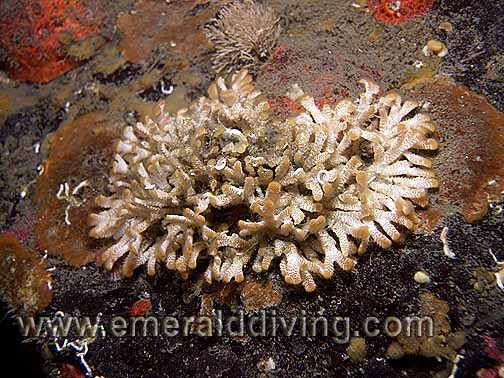 Also called a sea-lichen bryozoan. 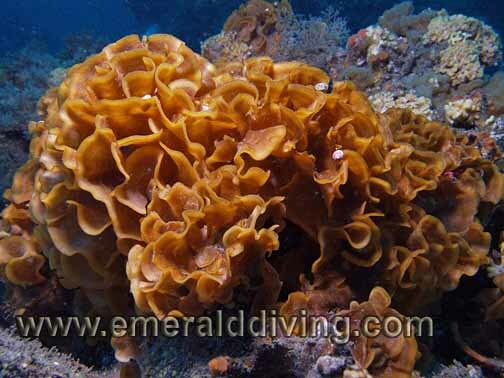 Photo taken at KVI Tower Reef in Puget Sound. ID: Series of flat branches emanating from a common source. Lies relatively flat. 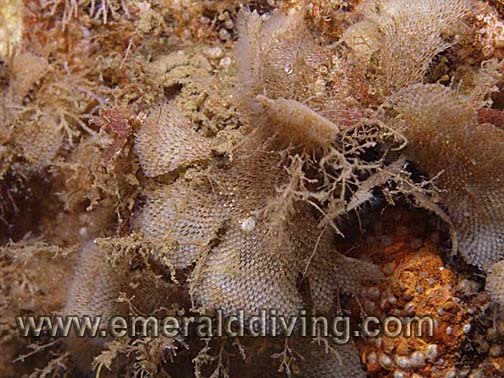 Comments: I have only noted this bryozoan when diving the Canadian Gulf Islands. 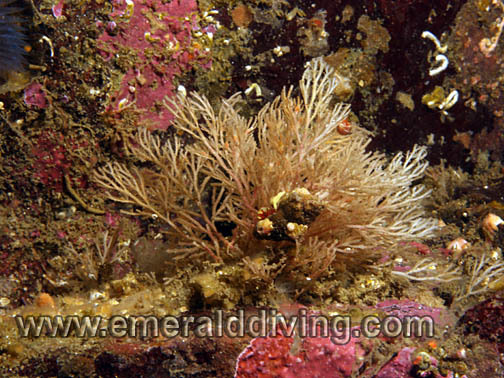 Photographed at Boiling Reef near Saturna Island. ID: Orange-brown coloration. Short, thick branching arms. Comments: This unassuming bryozoan dominates section around northern Vancouver Island. Photgraphed in Lucan Channel in Browning Pass. ID: Dense yellow antler-like branches, hard to the touch. 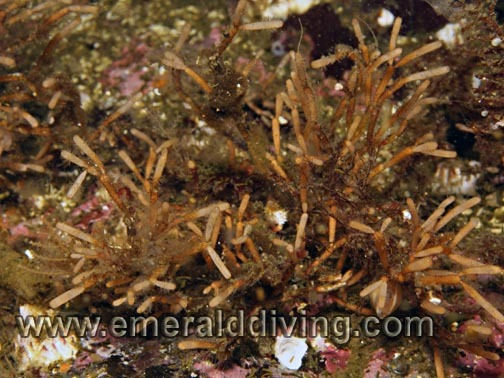 Comments: I often note small staghron bryozoans in Puget Sound and Hood Canal. 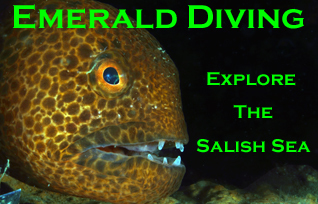 I can usually find bigger specimens in the San Juans, and spectacular specimes in the Cape Flattery area. Most things do grow bigger on the coast. 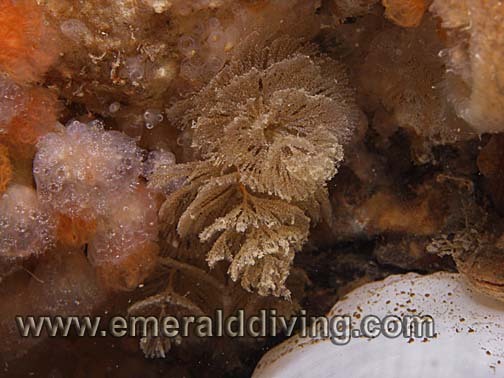 The photograph of this staghorn bryozoan was taken at Tatoosh Canyon. ID: Series or thin, branching arms. Each arm consists of segmented stick-like segments. 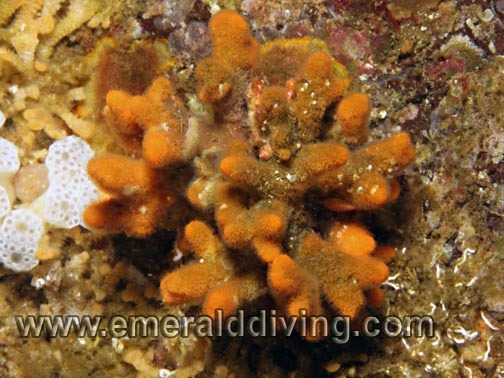 Comments: Another of the common bryozoan off Vancouver island. Photgraphed at Lucan Channel in Browning Pass, but could have been photgraphed at most sites around norther Vancouver Island. 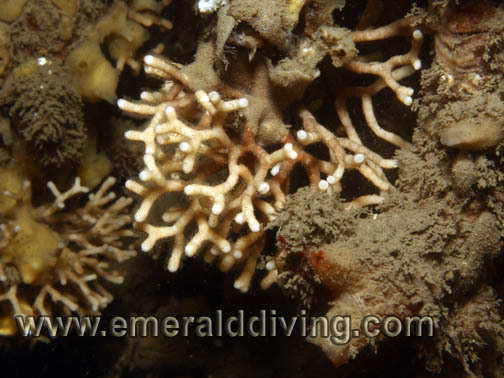 ID: Narrow branching arms, much thinner than staghron bryozoan. Usualy white/tan in color and tucked into areas somewhat out of the current. 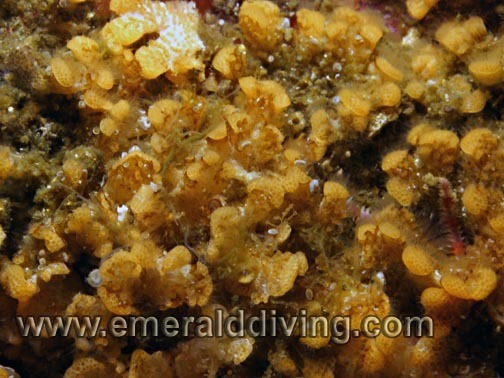 Comments: The unassuming bryozoan does very well in parts of the San Juan Islands. As it tends to be overshadowing by more striking species, it is often overlooked. Thousands of specimens can be found where this photo was taken - Davidson Rocks in the San Juan Islands. ID: Short spikes protruding from fleshy extensions. Typically yellow to tan in Washington waters. 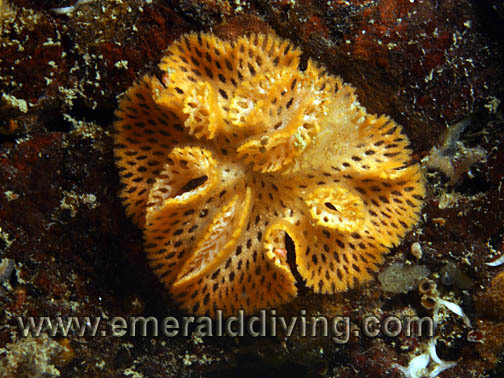 Comments: Another of the commonly encountered bryozoans in the San Juan Islands. 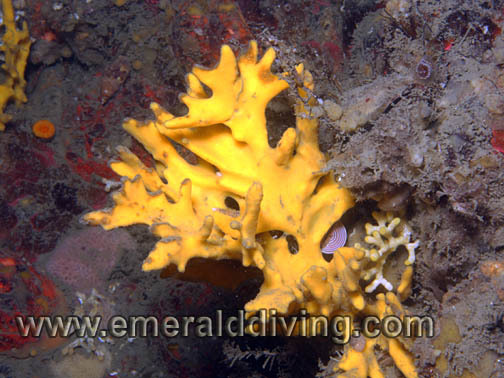 This seceimen was photographed at Davidson Rocks off the south end of Lopez Island. Like all bryozoans, this one is a colonial animal. ID: Unique and intricate folds exhibiting a delicate lattice-work. 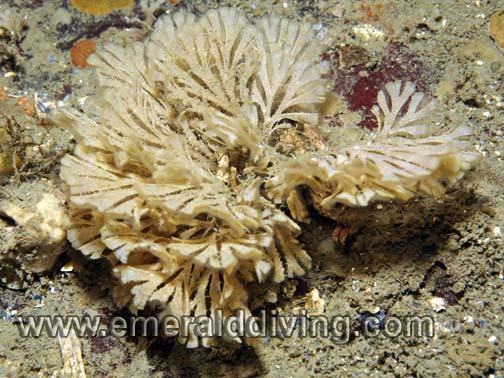 Comments: I don;t often note this bryozoan - and when I do, it is relatively small (1-2 inches). This specimen, photographed at Ruth Rocks in Browning Pass, British Columbia, is about 3" across. 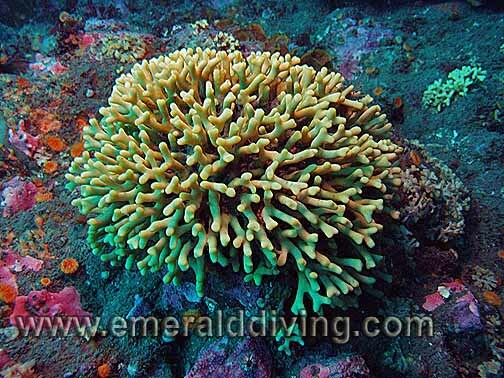 With larger anmials, the center may be dead as the new growth continues outward. ID: Heavily branched - brown to white color. Often found inverted or growing amongst other invertebrates. Comments: There are many species of white tuft bryozoans that are hard to distinguish from one another without examination in a lab. Photograph taken at Northwest Passage in Browning Pass, British Columbia.